Yipit, the site that aggregates and recommends daily deals based on users’ locations and interests (and raised $6 million back in June from a host of VCs), released some interesting trend data today on the daily deals space. Overall, July was not a memorable month for the daily deals industry, though there were a few clear winners, including everyone’s favorite deals site, the big kahuna, Groupon. 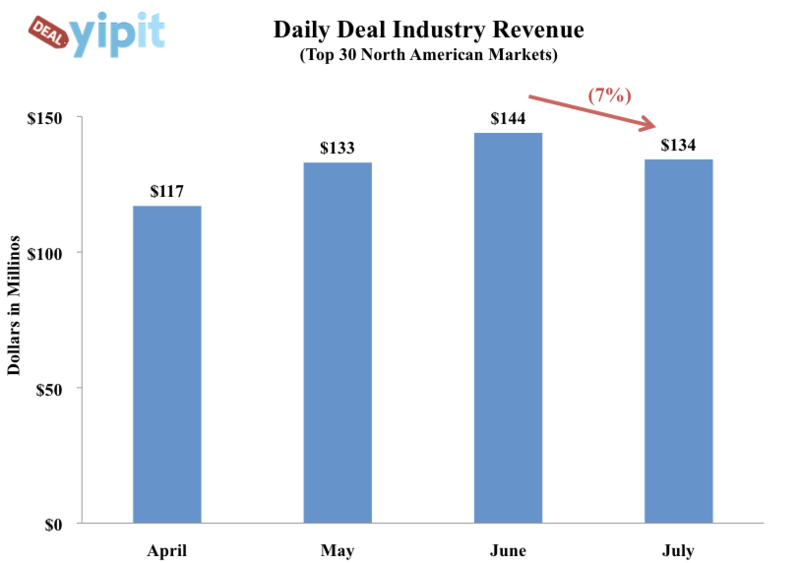 Based on data collected from over 650 daily deals services, Yipit found that the industry’s total revenue declined in July by 7 percent in North America’s largest markets — in spite of a slight increase in the number of total offers. The data also shows that the number of daily deals sites declined slightly in July, with 38 deals sites closing their doors compared to 36 new sites being launched. As for the big players, according to the report, Groupon’s revenue declined 4 percent from June, while, in contrast, LivingSocial’s revenue declined by a sizable 18 percent. Though Groupon widened the gap with its rival in July, the revenue of both companies declined by over 20% in the first half of July, compared to the first half of June. However, though Groupon’s revenue in the second half July actually increased over the second half of June, LivingSocial’s declined. 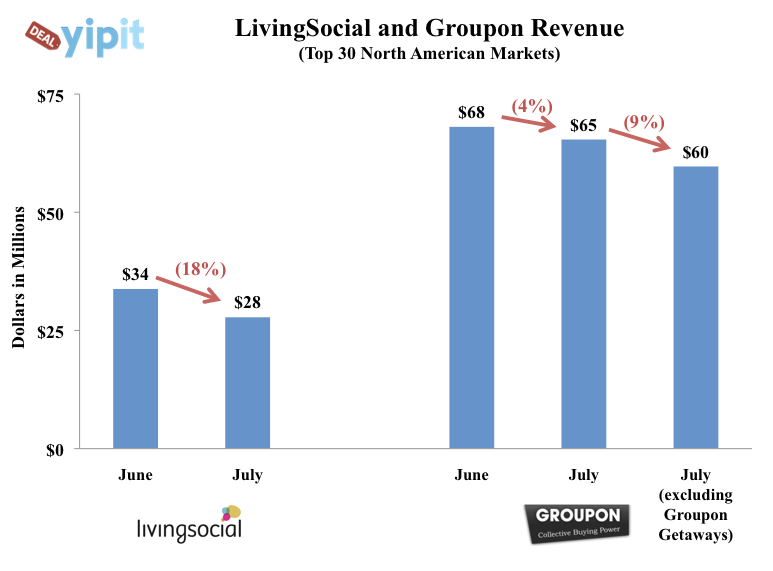 Also of note: Groupon generated more than twice as much gross revenue than LivingSocial. Not a good month for Groupon’s competitor. As one might guess from the preceding data, Groupon nabbed a bit of market share at the expense of its competitor, reversing a trend that had persisted over the last few months. 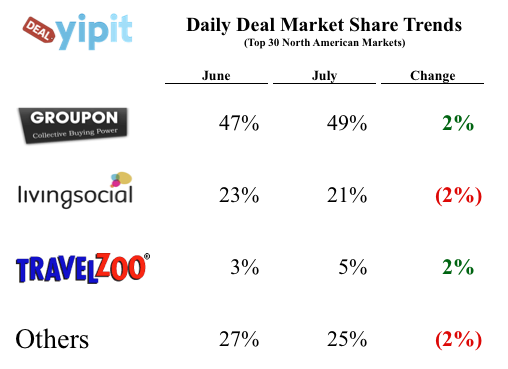 Thus, Groupon continues to retain its iron grip on total market share, representing nearly 50 percent of the total daily deal market, more than twice the size of LivingSocial at 21 percent, and far more than the next contender on the list, Travelzoo, which currently represent a mere 5 percent of the market. Groupon also owned the highest grossing deal in July, the report said, as its Photoboom America deal generating $575,505 of revenue in the top 30 North American markets. Groupon and LivingSocial dominated the top ten grossing deals in the space, with six of the top ten, compared to four for LivingSocial. Some other interesting data points include the fact that, despite its relatively small chunk of market share compared to the top dogs, Travelzoo continued to aggressively expand its “local deals” offering, increasing the number of deals offered in the top 30 North American markets by 48 percent, recording a revenue increase of over 35 percent. And it seems that, just as Google must be mentioned in seemingly every other industry trend report out there, the search giant is now finding its way into daily deals statistics as well, as Google Offers “continue to have significantly lower prices and revenue per deal than Groupon or LivingSocial deals”, according to the report. That being said, while Google Offers’ average number of vouchers was only slightly less than that of Groupon and LivingSocial, revenue per deal was significantly lower. Google Offers launched in Portland, but has expanded to New York and San Francisco. Of course, while Google hopes to begin making waves in its new cities, especially considering that the report found that Google Offers struggled in Portland in July, generating less that 10 percent of the revenue that Groupon made in Portland in July. But perhaps the biggest winner in the daily space were “travel deals” sites, which continued to expand in July, accounting for six of the top 10 deals in July — and became the third-largest daily deal category, with travel deals accounting for six of the top 10 deals and nearly 15 percent of the industry’s revenue. Excerpt image courtesy of Dagger Tools.